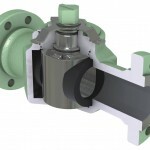 The NEWCO Forged Steel Valves are ideal for downstream applications and critical Power Industry applications.The welded bonnet joint eliminates the body/bonnet flanges reducing weight and simplifying the application of exterior insulation. The welded bonnet ensures containment of the high pressure applications experienced within the Power Industry. This, in concert with the forged steel body, provides the highest integrity seating available. Categorías: -Válvulas-, Compuerta, Globo, Retención. Etiquetas: Cameron, Newco®. NEWCO forged steel bolted and welded bonnet gate valves are ideal for bi-directional flow and tight shutoff. Due to the flow characteristics of the wedge-to seat design, gate valves should be operated in the full-open or full closed position. 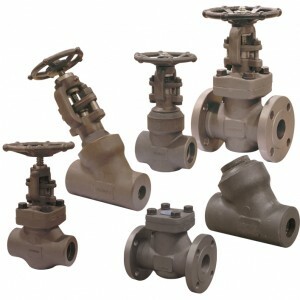 Gate valves are utilized in applications where minimum pressure drop is desired. NEWCO forged steel bolted and welded bonnet globe valves are ideal for unidirectional, controlled flow. 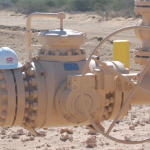 The flow characteristics of a globe valve are repeatable, consistent and easy to control at various open positions, which makes the design ideal for general flow regulation. 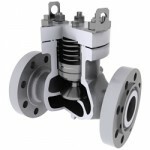 The Y-pattern globe valves offer the same flow capabilities as standard globes. The smooth Y-pattern allows for less turbulence and lower pressure drops. NEWCO forged steel bolted and welded bonnet check valves yield minimal restrictions to low-velocity environments and are ideal for preventing backflow in unidirectional flow applications in horizontal or upward (vertical) flow. 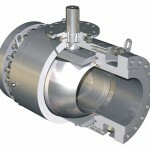 Piston and ball check valves with a spring allow for both horizontal and vertical installation.